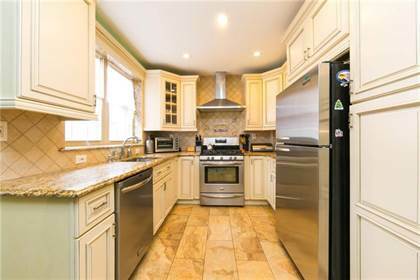 TOTALLY (HIGH END) RENOVATED BATH BEACH 2 FAMILY 3 over 1 BRICK TOWNHOUSE. A very extensive and beautifully executed 2 floor brick rear extension and total renovation/restoration of the entire house, including a 32 ft. by 20 ft. Living/Dining room, extensive high end interior design elements and detailing throughout. Garage and additional 1 car parking in the Driveway. Major attention to quality building construction; total infrastructure and all NEW mechanical, HVAC systems, custom mill-work, 3 new baths and 2 new kitchens (main eat in) of the high quality. As part of the renovation project all the plumbing in the home has been changed up to and the city lines; the electric system was updated and rewired to a new main panel in a new utility (boiler room) built up from the ground to house the heating and water systems, two large split 5 zone HVAC (Heat, Ventilation, Split Air Conditioning ) provides year round clean air and comfort, 4 zone state of the art security, light dimming for energy efficiency, top rated conventional gas heat/water systems, a new Laundry room, etc. etc. to complete the total package. Perfectly executed with high construction standards throughout. NEW C of O issued! Located just up the block from access to the Shore Parkway Promenade, minutes to the playgrounds, golf and tennis, the city's only golf school for children, DISTRICT 20 SCHOOLS, great shopping, the Manhattan Express (x28/x38) on your corner, the D train and the B8 to get you anywhere in NYC, convenient to all 3 Metro Airports for your travels. For the most discerning customers, this one is a real beauty. Hi, I'd like to find out more information about 8883 18 Ave. Thanks so much!